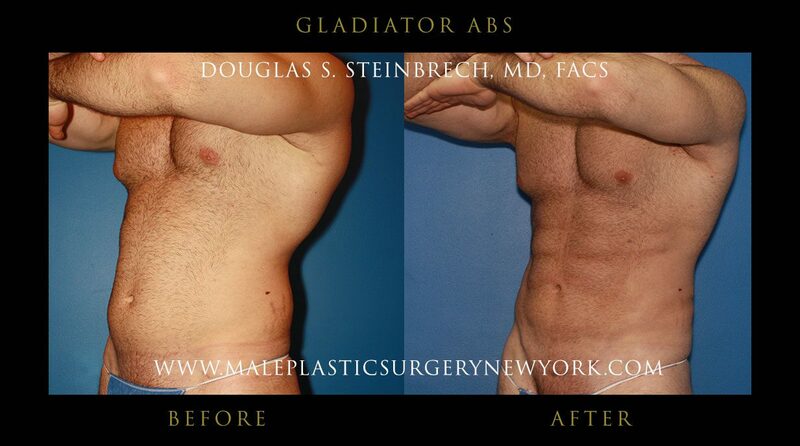 Gladiator Abs™ Developed by Dr. Douglas Steinbrech to get the abs you always wanted! 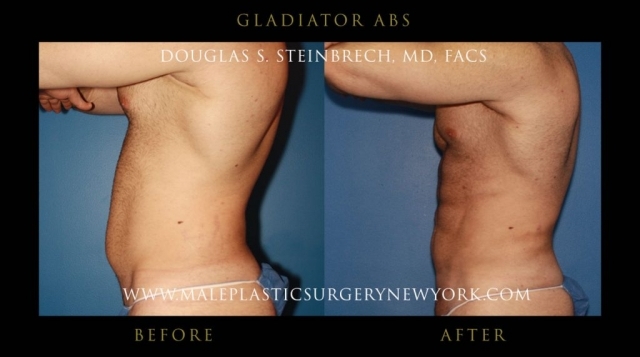 A procedure commonly referred to as abdominal etching prior to Dr. Douglas Steinbrech perfecting the technique with his Gladiator Abs™ to surgically enhance appearance and improve the definition of abdominal muscles. 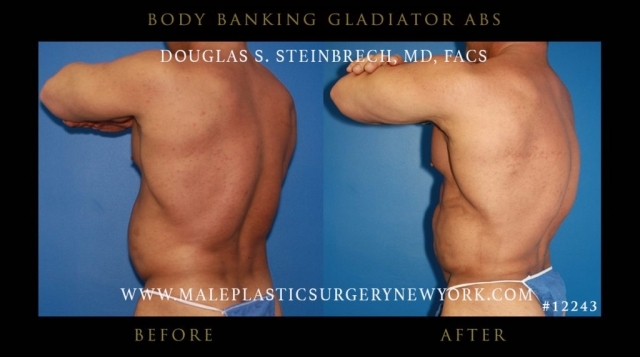 This innovative procedure removes unwanted fat and sculpts your abs definition to help you get ripped abs you always wanted. 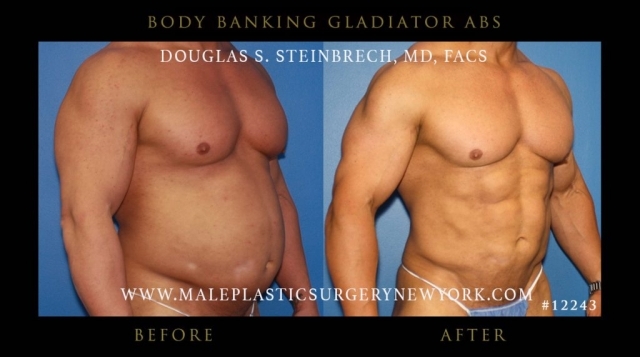 That has certainly never rang more true when it comes to diet, exercise, and the lasting effects on one’s midsection. 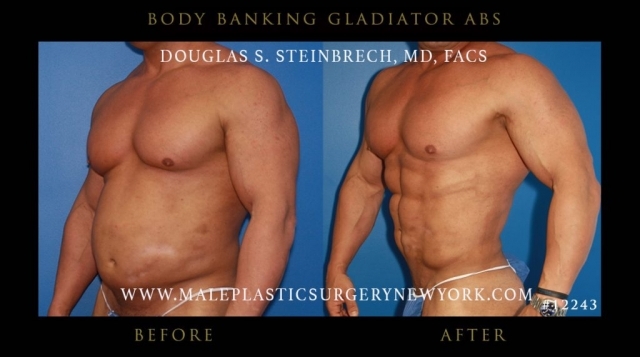 Reality exposes the harsh truth that even the most well-disciplined individuals with toned abs can still be concealed under a layer of fat. 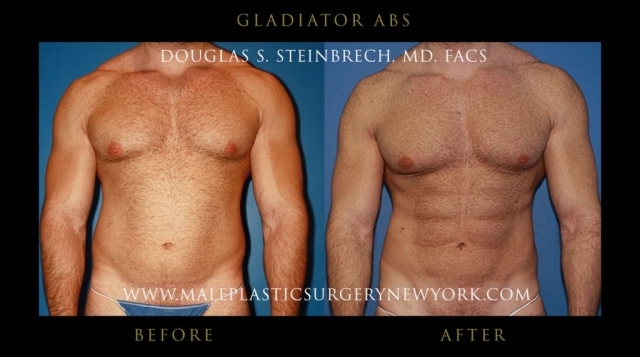 Gladiators exemplify a physique that still exudes masculinity while promoting the ultimate strong, defined healthy body prototype. 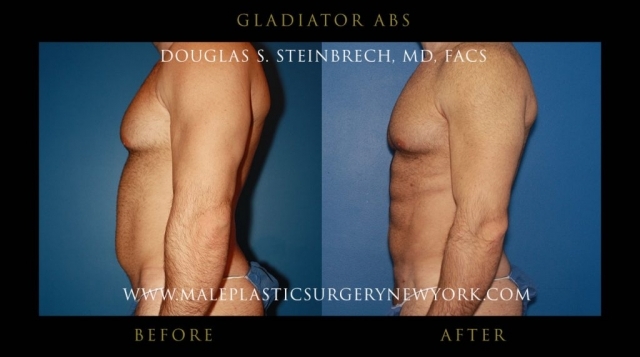 Gladiator Abs represent a technique and style developed by Dr. Douglas Steinbrech to achieve a specific look when diet and exercise have plateaued. 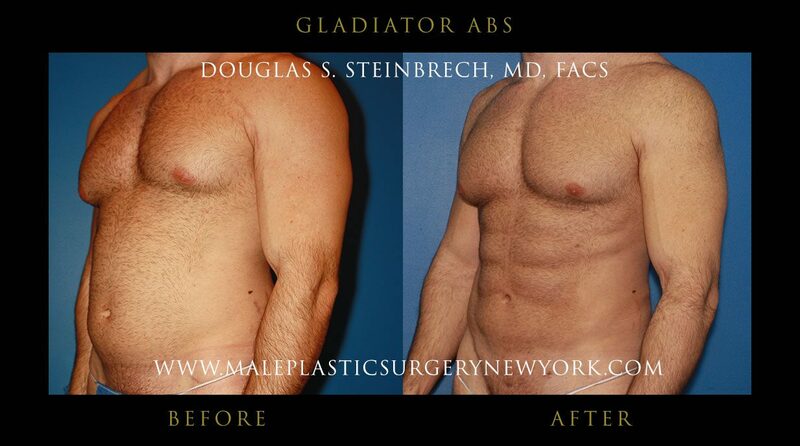 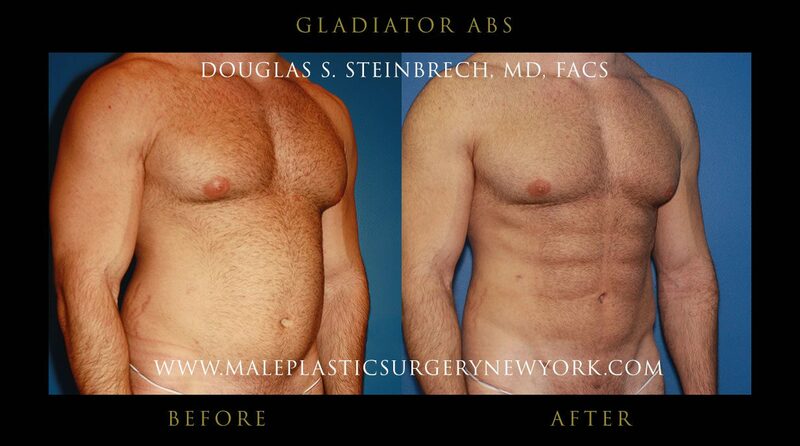 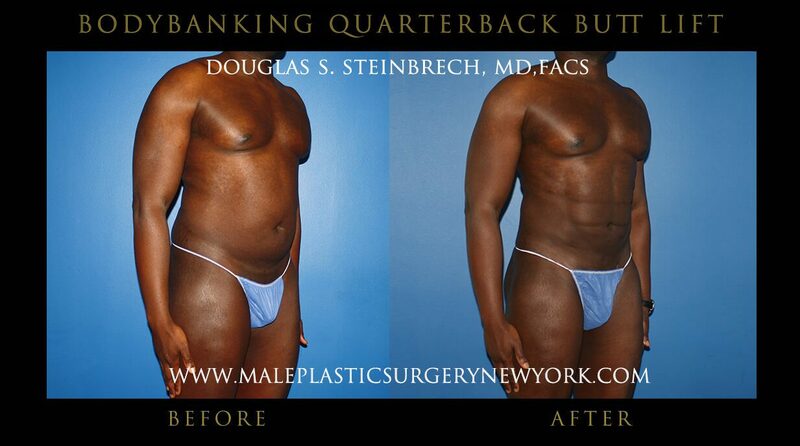 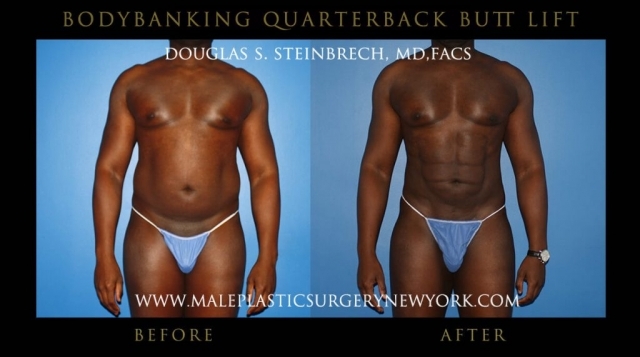 Below are Gladiator Abs male patients who were operated by Dr. Steinbrech’s. View case studies of actual patients to see how Gladiator Abs improved their confidence this new innovative techniques in cosmetic surgery. Technique Used: Gladiator Abs using Dr. Steinbrech’s technique; “Muscle-Lipo” contouring. 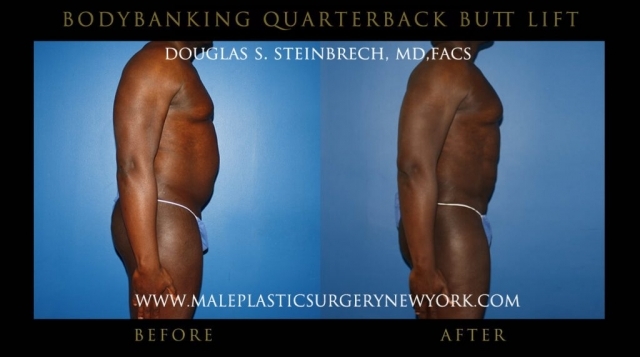 Technique Used: Liposuction of the back roll, thighs and flanks (love handles), fat grafting to the glutes. 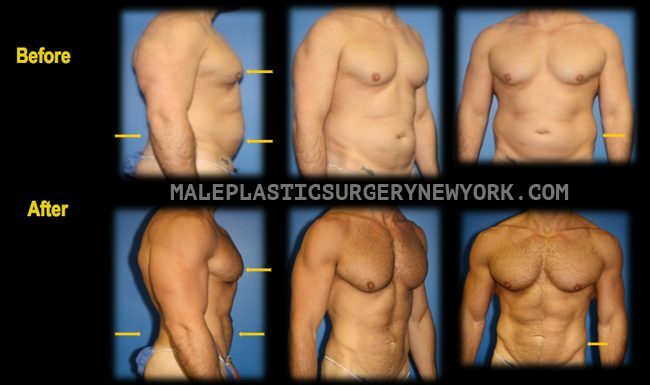 This surgery produces optimal results that accentuate existing muscle tissue by ridding the body of excess fat and skin, revealing the “six pack” that has been in hidden from yourself and other admirers. 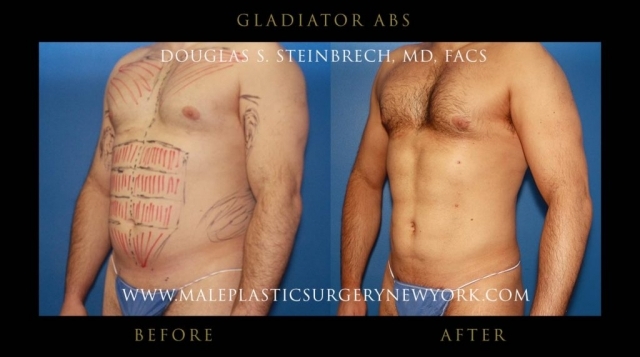 Gladiator abs take liposuction surgery and tummy tucks a step further as Dr. Steinbrech can actually sculpt or “etch” on top of the tissues of the abdomen to achieve successful results and unveil the Gladiator within. Your abdominal region will appear firm, tight, and more muscular than ever before through the Gladiator abs technique! The overall time to execute the procedure takes approximately an hour. 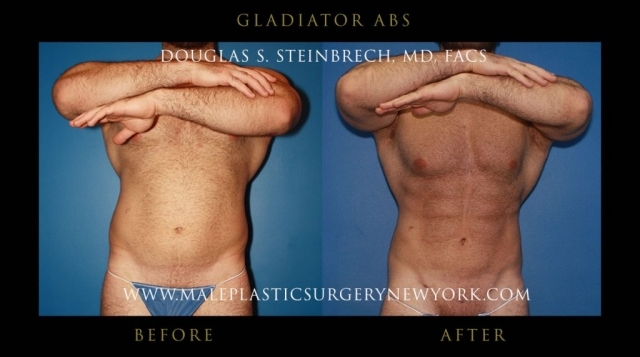 Gladiator abs can be performed as an outpatient procedure administering either local or general anesthesia. Prior to surgery, Dr. Steinbrech will trace the outline of the patient’s abdominal muscles. 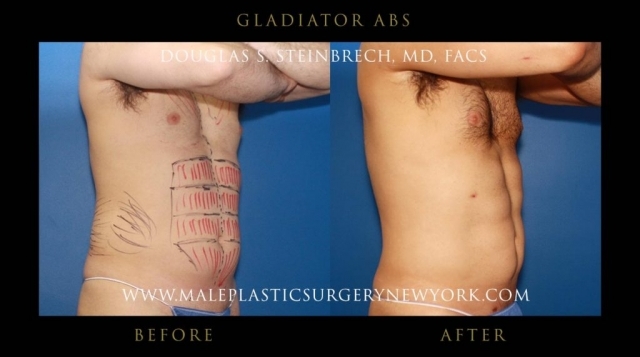 The lines drawn will act as a guide for Dr. Steinbrech to follow during surgery as several small incisions will be made around the belly button following the natural crease of the abdomen. 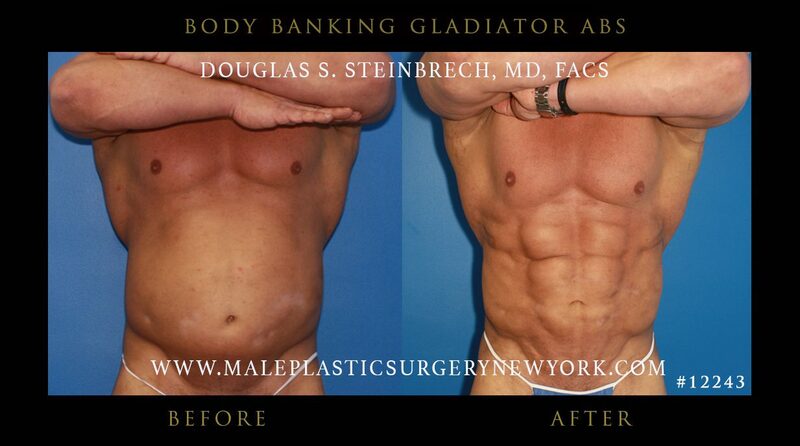 A small metal tube called a cannula will be inserted underneath the skin for that raised ab effect. 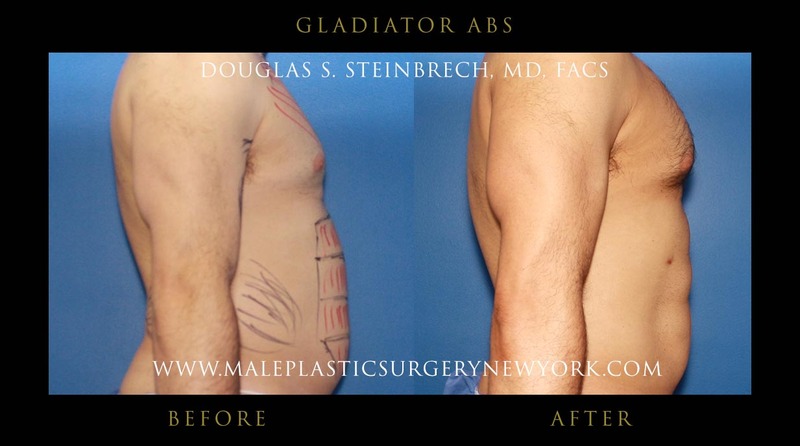 Using a liposuction approach, excess fat is removed along the lines drawn by the surgeon, sculpting the abs into the desired contours. 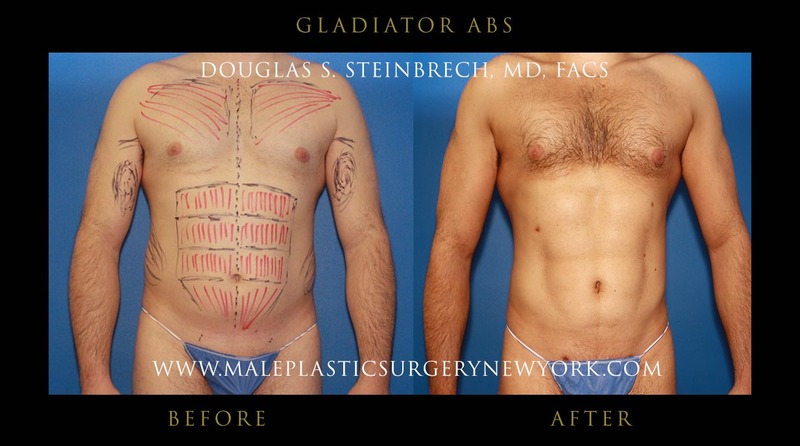 The incisions typically measure less than a quarter of an inch but may or may not require sutures to conclude the procedure. 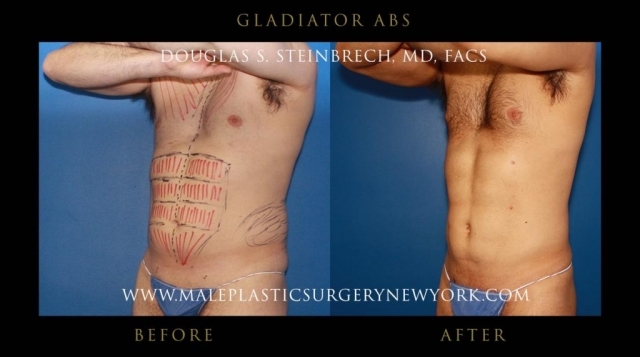 Gladiator Abs are not appropriate for an individual with a significant amount of weight to lose from the abdominal region. 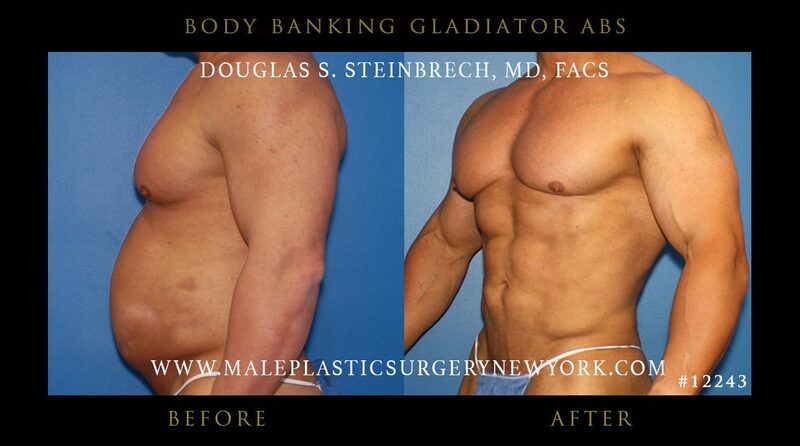 The ideal candidate for this procedure should already be physically fit with an athletic muscle build. 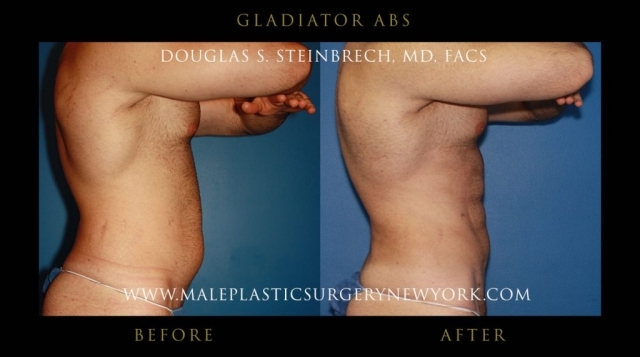 The Gladiator Ab technique will only be optimally effective when the individual sustains only relatively small pockets of fat concentrated in midsection. 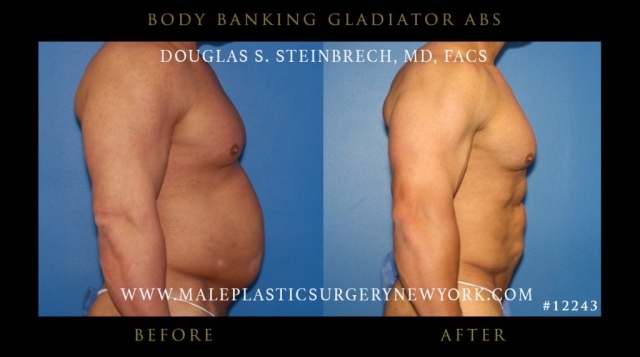 Individuals with a body fat percentage of greater than 18% are not appropriate candidates for this procedure. 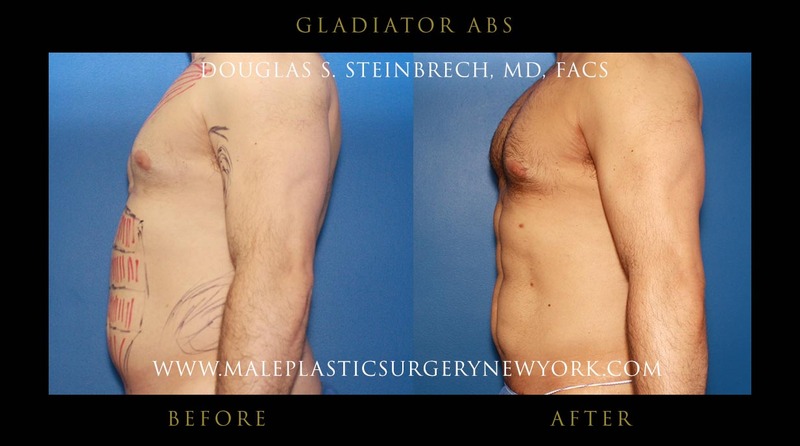 Those considering to undergo this procedure should understand that after this surgery, following a healthy diet and exercise regimen is still essential to maintaining the results. 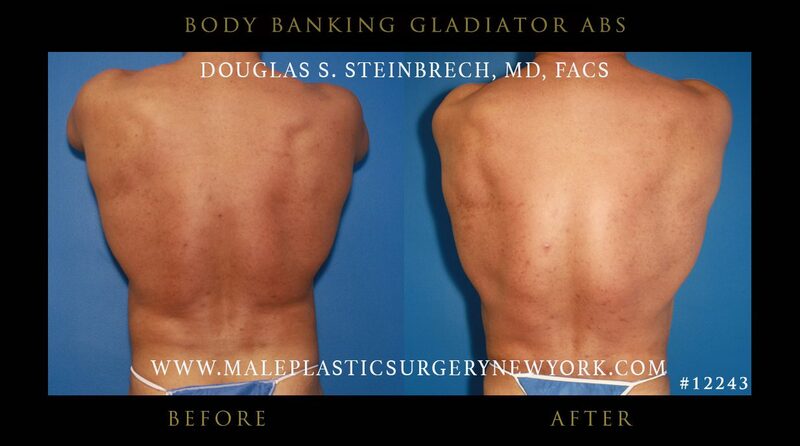 It is imperative to consult with a highly acclaimed surgeon to ensure satisfactory and evenly aesthetic results. 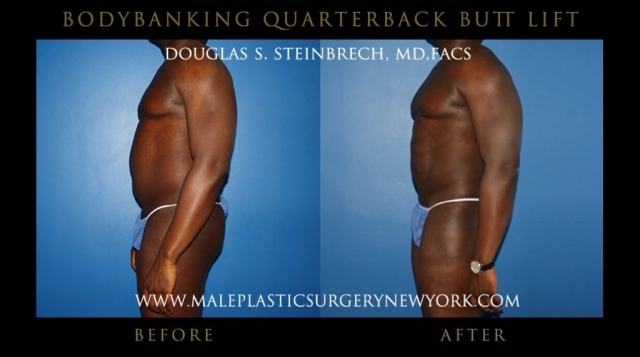 When not performed by a credible, certified surgeon it is conceivable to experience temporary to permanent nerve damage around the belly button. Recovery time can vary for each individual. 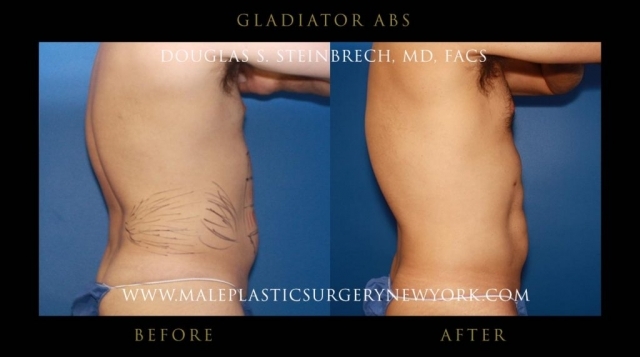 You can expect to experience some pain and discomfort, which should be manageable using over-the-counter pain medications. 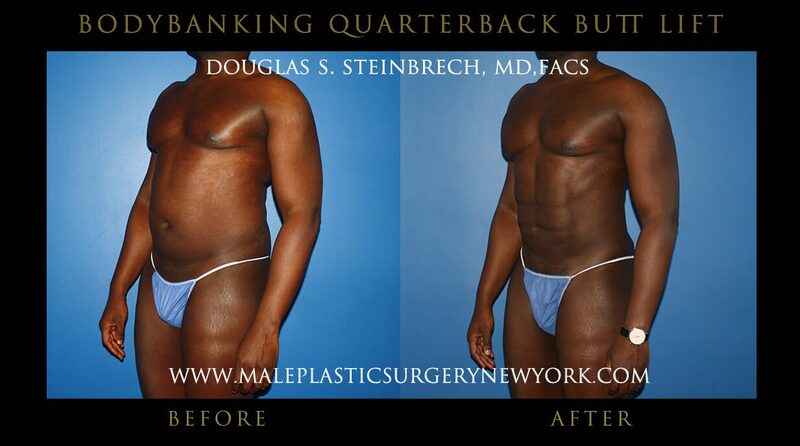 Most patients return to work in about a week. Gladiator Abs will become fully apparent within six months, after your body has had sufficient time to heal. Dr. Steinbrech may instruct you to wear a compression garment over your abdomen for several weeks. 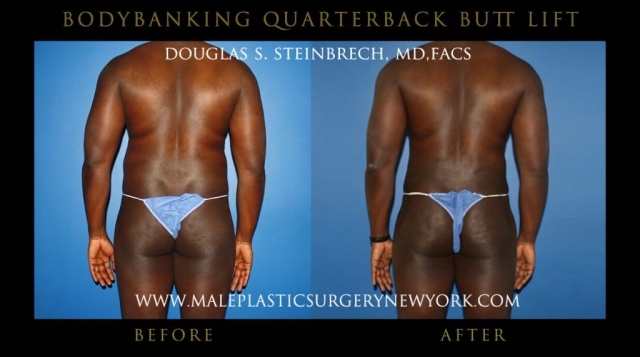 This will reduce swelling and help the tissues to adjust to their new contours faster. 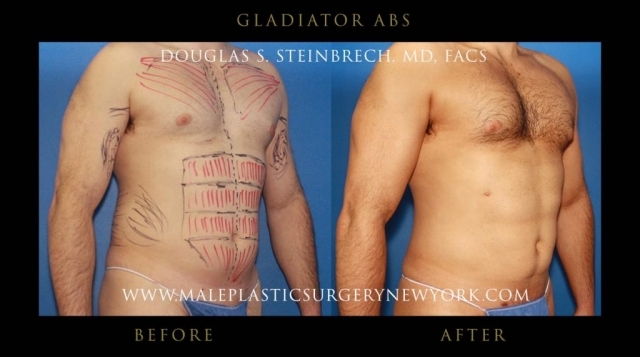 For the first week or two after surgery, strenuous activities and heavy lifting should be avoided. For more information about Gladiator Abs, please call (646) 480-7750 or contact Dr. Steinbrech’s New York clinic to set up your no-obligation consultation today. For out of town patients, please learn more about our Fly-In program.